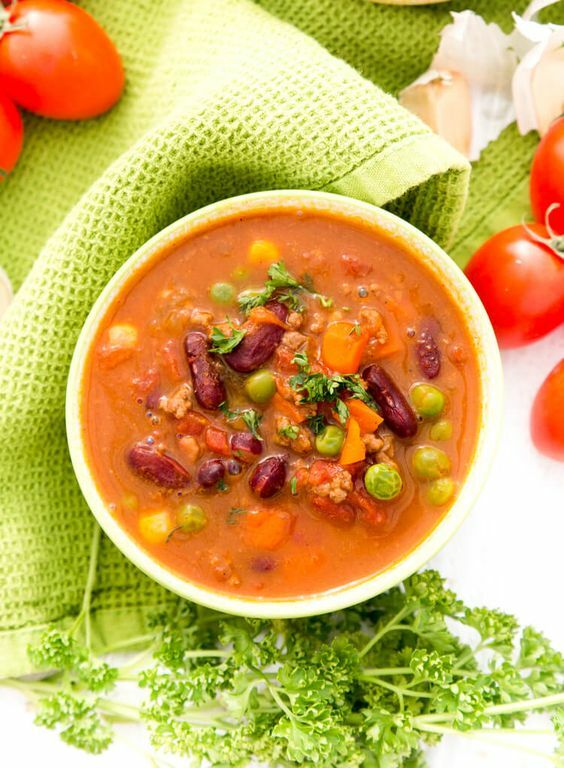 This one-pot chili recipe is both satisfying and full of healthy goodness. My mom shared this quick chili recipe with me a few years back. The best part is that it is made all in one pot! Don't you love these kind of recipes, because really, who wants to stand and wash so many dishes? (Not me.) I always cook with organic ingredients, but I realize that not everyone does. However, do add a few pennies in for organic and a BPA - free lining within your can of tomatoes. In a large pot, heat up 2 Tablespoons of olive oil. To the pot add in 1 pound of lean ground beef and a pinch of salt. Sauté for 10 minutes stirring occasionally. Add the onion. Sauté for another 5 minutes. Add garlic and 1 can of diced tomatoes (with juice). Add frozen vegetables, then the red kidney beans. Stir the mix all together. Pour in 4 cups of vegetable broth. Bring to a boil, then boil for 3 minutes.